Land use and transportation have an extremely complex interrelationship. Often, problems with the transportation system are blamed on faulty land use policies, and problems with sprawling land use are blamed on transportation policies. In fact, the problems typically do not have simple cause-and-effect solutions. This lesson takes a look at ways in which land use regulations can be improved to support an intermodal transportation system that encourages access by walking, bicycling, and transit. Most communities in the United States have land use regulations that primarily support automobile access to local destinations. Substantial changes to zoning laws and subdivision regulations will be necessary in many communities in order to accomplish fundamental improvements to the transportation system. In addition to ordinances that require bicycle parking and sidewalks, even more basic changes are needed for automobile parking requirements, street design standards, allowable land use densities, and transit-oriented developments. One of the most important factors in a person’s decision to walk or bike is the proximity of goods and services to homes and workplaces. The most conducive land use for pedestrian activity is one with a higher density mix of housing, offices, and retail (see figure 5-1). Studies have also shown that more people walk in areas that are able to achieve higher densities of either housing or employment, despite lower densities of other uses such as retail. One study of the Puget Sound Region in Washington State defines high density as 50 to 75 employees per acre or 9 to 18 residents per acre. Pedestrian and bicycle travel is often an afterthought in the development process. The results are impassable barriers to pedestrian travel, both within and between developments. The examples below show how local zoning ordinances can be amended to require more attention to the needs of pedestrians and bicyclists. Subdivision Layout. A residential subdivision layout (including planned unit developments) should provide safe, convenient, and direct bicycle and pedestrian access to nearby [within 0.4 km (0.25 mi) for walking and 3.2 km (2 mi) for bicycling] and adjacent residential areas, bus stops, and neighborhood activity centers such as schools, parks, commercial and industrial areas, and office parks. Figure 5-1. Photo. Low-density, single-use zoning creates trip distances that are too great to make walking a viable transportation option. Cul-de-Sacs.Cul-de-sacs have proven to be effective in restricting automobile through traffic; however, they can also have the effect of restricting bicycle and pedestrian mobility unless public accessways are provided to connect the cul-de-sac with adjacent streets (see figures 5-2 and 5-3). Trail connections between cul-de-sacs and adjacent streets should be provided wherever possible to improve access for bicycles and pedestrians. Figure 5-2. Illustration. Cul-de-sacs can restrict pedestrian and bicycle access. Figure 5-3. Illustration. Loops are preferred to cul-de-sacs. Future Extension of Streets. During subdivisions of properties, streets, bicycle paths, and sidewalks should be designed to connect to adjacent properties that are also likely to be subdivided in the future, so that a secondary system of roads and sidewalks develops over time. When subdivisions are built with only one outlet to a main thoroughfare, the result is heavy traffic congestion and difficult intersections for both motorists and pedestrians. Inclusion of Bicycle and Pedestrian Facilities in Piecemeal Development. This is intended to ensure that pedestrian and bicycle facilities are included in projects that occur in a piecemeal fashion. For projects in which only part of the land owned by the applicant is proposed for development, a sketch plan showing the tentative locations of streets, bicycle facilities, and public accessways should be submitted for the entirety of the land owned. Stub-outs (open connections for future development) should be constructed for bicycle and pedestrian facilities onsite, and the next construction phase should be designed to connect to this network. Internal Bicycle/Pedestrian Circulation for Commercial and Business Developments. Adequate provisions should be made for bicycle and pedestrian circulation between buildings and related uses on development sites. The Americans with Disabilities Act (ADA) also contains regulations for onsite circulation. Lot Coverage. Zoning codes should be amended to raise the allowable lot coverage along bus routes to encourage intensified and more efficient uses of land in these areas. Parking in High-Density Residential Developments. In some high-density residential areas, existing regulations require off-street parking and, at the same time, a reduced lot frontage. This results in home fronts that primarily consist of garage doors. Ordinances should be modified to allow for rear-lot access (alleyways) or other innovative solutions in these areas (see figure 5-4). Figure 5-4. Illustration. Typical alley: ordinances should be modified to allow for rear-lot access. Parking Reductions. Parking codes should be modified to allow a reduced parking option for developments that are located on bus routes and provide facilities that encourage bicycling and walking. In general, shopping center parking lots should not be designed to handle volumes that occur only once or twice per year, but rather more typical volumes. Compliance with Design Standards. Bicycle and pedestrian facilities should be designed to meet local and statewide design standards. Many communities throughout the country are conducting extensive revisions to their zoning and subdivision regulations in light of new planning techniques that improve transportation and community design. New rules that would allow parking reductions and higher density developments are likely to be controversial. Public education for citizens and elected officials is essential to gain popular support for these new regulations. Land developers should be asked to submit a pedestrian and bicycle mobility plan early during the site plan review process. This plan should provide an inventory of all existing and proposed land uses adjacent to the site, and illustrate a logical circulation plan for pedestrians and bicycles within the development and between adjacent land uses. The questions in table 5-1 below can help design professionals create site plans that are sensitive to the needs of pedestrians. Table 5-1. Site plan checklist. Does the plan meet ADA standards? Are utilitarian paths direct? Do they provide connections to pedestrian magnets nearby? Can pedestrians take advantage of shortcut paths that encourage walking instead of driving? Does the pedestrian system consider the type and probable location of future development on adjacent or nearby parcels of land? Is there flexibility to provide direct connections to adjacent parcels, should that connection be desired in the future? Are building entrance areas convenient to the pedestrian? Are they clearly evident through design features, topography, signing, or marking? Are walkways along the street buffered from traffic as much as possible? Are crossings of wide expanses of parking lots held to a minimum? Are pathways generally visible from nearby buildings and free from dark, narrow passageways? Is adequate pedestrian-scale lighting provided for nighttime security? Are sight lines at intersections adequate for pedestrian visibility? Are pedestrians able to see oncoming traffic, given typical speeds? Do pathways lead to road crossing points with the least conflict? In general, are pedestrian/vehicle conflict points kept to a minimum? Are pedestrians given adequate time to cross the road at intersections? The physical layout of a development can often make the difference in a person’s choice to walk between stores or to adjacent developments. Careful attention should be given to the location of buildings as well as the configuration of parking lots. Several provisions can ensure a better walking environment in commercial and office developments. Building Setbacks. Buildings should not automatically be separated from the street by parking lots—this discourages pedestrian access and primarily serves those who arrive by automobile. A maximum setback requirement of 4.6 to 7.6 m (15 to 25 ft) can help to encourage pedestrian activity. Parking, driving, and maneuvering areas should not be located between the main building entrance and the street. Parking lots should be located on the side and rear yards of the property whenever possible. For developments with multiple buildings, direct pedestrian access to public transit should be provided by clustering buildings near bus stops. Building Orientation and Facades. Main building entrances should be oriented to face the street designated as a bus route. Entrances and paved walkways should lead directly to a bus stop. Visual stimulation is very important to pedestrians—long, blank walls with no openings onto the street discourage walking. Building facades should maintain continuity of design elements such as windows, entries, storefronts, roof lines, materials, pedestrian spaces and amenities, and landscaping. Parking garages on streets with bus service should have ground-floor street frontage developed for office, retail, or other pedestrian-oriented uses. Onsite Walkways. For developments with multiple buildings and/or outparcels, all building entrances on the site should be connected by walkways to encourage walking between buildings and to provide a safe means of travel for pedestrians. Sidewalks between the building edge and parking lots should allow pedestrians safe and convenient access to building entrances without having to walk within driving aisles of parking lots. Pedestrian Access Between Adjacent Developments. To encourage walking instead of driving between uses on the development site, sidewalks should connect those uses to adjacent activity centers. Barriers such as fences or vegetation should not be placed so as to hinder access between developments. Table 5-2. Levels of illumination for sidewalks. Improvements Between the Building and the Street. Design elements in the area between the building and the street are critical to successful pedestrian spaces. The streetscape should provide visual interest for the pedestrian. The area should be landscaped if project budgets allow. Location. Keep parking on one or two sides of the shopping center, away from the side that will generate the most pedestrian access. This pedestrian access point could be an office park, outparcel shopping or restaurant, or a residential area. Direct Pedestrian Paths. Provide a direct pedestrian path from parking lots and parking decks to the buildings they serve (see figure 5-5). Clearly delineate this path by striping, using different paving materials, or situating the path through the center of a series of strategically placed parking islands. Figure 5-5. Illustration. Provide pedestrian connections between parcels. Use of Landscaping. Landscaping can be used to channel and organize the traffic flow in parking lots as well as to provide pedestrian refuge areas. Avoid open parking lots that allow cars to move in any direction. Bicycle Parking. Provision of bicycle parking at destinations is crucial—without it, bicycling becomes far less convenient. Bicycle parking ordinances can help to improve the situation (see lesson 22 for a full description). The Form Based Code is a legal document that regulates land development, setting careful and clear controls on building form, with broad parameters on building use, to shape clear public space (good streets, neighborhoods, and parks) with a healthy mix of uses. With proper urban form, a greater integration of building uses is natural and comfortable. The Form Based Code uses simple and clear graphic prescriptions and parameters for: height, siting, and building elements to address the basic necessities for forming good public space. The Regulating Plan. The regulating plan is the coding key for The Columbia Pike Special Revitalization District Form Based Code that provides specific information on permitted development for each building site. The regulating plan also shows how each lot relates to public spaces (streets, civic greens, pedestrian pathways, etc.) and the surrounding neighborhood. There may be additional regulations for lots in special locations/situations identified in the regulating plan. The Building Envelope Standards. The building envelope standards establish basic parameters governing building form, including the envelope for building placement (in three dimensions) and certain permitted/required building elements such as balconies and street walls. The building envelope standards establish the boundaries within which things may be done and specific things that must be done. The applicable standard for a building is determined by its street frontage contained in the regulating plan. This produces a coherent street and allows the building greater latitude behind its street facade. The intent of the building envelope standards is to shape a vital public space (Columbia Pike and its adjoining streets) through placement and envelope controls on private buildings. These standards aim for the minimum level of control necessary to meet that goal. The Architectural and Streetscape Standards. The goal of the architectural standards is a coherent and pleasing architectural character that complements the best local traditions. The architectural standards govern a building’s architectural elements regardless of its building envelope standard and set the parameters for allowable materials, configurations, and construction techniques. Equivalent products or better (as determined by the administrative review team) than those specified are always encouraged and may be submitted for approval to the county. The purpose of the streetscape standards is to ensure coherent streets and to assist builders and owners with understanding the relationship between the public space of the pike and their own building. These standards set the parameters for planting trees and other amenities on or near each building site. For more information on performance-based codes, refer to the resources at the end of this lesson. Streets that are laid out in well-connected patterns on a pedestrian scale so that there are alternative automobile and pedestrian routes to every destination. A cul-de-sac pattern generally limits connectivity and is therefore discouraged. A well-designed street environment that encourages intermodal transportation. These streets should include pedestrian-scale lighting, trees, sidewalks, and buildings that are within close walking distance to the sidewalk. Residential and internal commercial streets should be relatively narrow in order to discourage high-speed automobile traffic. On-street parallel parking is recommended where it can be used as a buffer between pedestrians and motor traffic. Parked cars also serve to slow down the passing traffic, helping to balance the overall use of the street. Bicycles are considered an integral part of the transportation mode mix, and the design of the streets includes appropriate facilities for them. The buildings are generally limited in size, and building uses are often interspersed—that is, small houses, large houses, outbuildings, small apartment buildings, corner stores, restaurants, and offices are compatible in size and are placed in close proximity. In addition to streets, there are public open spaces, around which are larger shops and offices, as well as apartments. Larger communities should provide a neighborhood center (providing small-scale commercial and office uses) within a 5-minute walking distance (roughly a 0.40 m (0.25 mi) radius) for the majority of residents in the neighborhood. Zoning and subdivision regulations often pose a significant barrier to implementing the design features discussed in this lesson. While some land development regulations have been revised to encourage the construction of multimodal neighborhoods and commercial areas, unforeseen complications often get in the way of achieving the livable community that was envisioned. The purpose of this lesson is to learn more about the development process and the reasons behind final outcomes in the built environment. Select a development in your community that was built in the last 2 years. Using the principles described in this lesson, prepare a critique that describes how well the development supports walking and bicycling, as well as automobile travel. Are densities and mixes of uses sufficient to encourage walking trips? Are streets and pathways designed to accommodate and encourage walking and bicycling? Are commercial areas oriented to people arriving in automobiles, or to people arriving on foot? Review the land development regulations that were in place when this development was built. Interview a local planner to find out the circumstances that led to any deficiencies in the design—often local county planners are well aware of better designs, but are unable to require developers to implement them. How did elected officials influence the process? Prepare a paper (five pages or less) that summarizes your research and provides conclusions that explain the reasons why desirable—and undesirable—features of the development occurred. A few tips: Avoid selecting a development that is not yet completed, since some pedestrian and bicycle features are sometimes built later in the development process (such as shared-use path networks). When calling the local planning department of the jurisdiction responsible for the project, ask to speak with one of the planners who was responsible for working with the developer. For extra credit, speak with the developer of the property, and ask his/her perspective about aspects of the development that were successful and unsuccessful in his/her opinion, particularly in accommodating pedestrians and bicyclists. Picture This. . . The Results of Visual Preference Survey, A. Nelessen & Associates, Princeton, NJ, and Seattle, WA, 1993. Harris. C.W., and N.T. Dines, Time-Saver Standards for Landscape Architecture, McGraw-Hill, New York, NY, 1988. The Columbia Pike Special Revitalization District Form Based Code, Arlington County, VA, 2003. Available online at http://www.arlingtonva.us/Departments/CPHD/forums/columbia/ current/CPHDForumsColumbiaCurrentCurrentStatus.aspx. "Neo–Traditional Neighborhood Design and its Implications for Traffic Engineering," ITE Journal, vol. 62, no. 1, January 1992, pp. 17 –18. 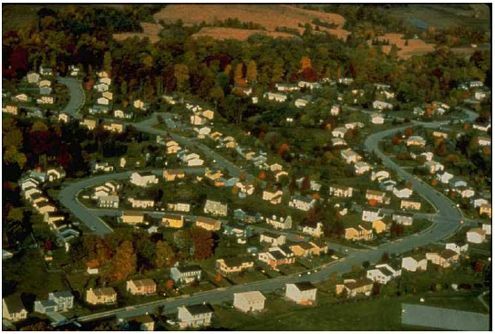 Models and Guidelines for Managing Maryland’s Growth—Modeling Future Development on the Design Characteristics of Maryland’ Traditional Settlements, Maryland Office of Planning, 1994. Oregon Transportation Planning Rule, American Planning Association, Washington, DC,1993. Urban Planning Tools for Quality Growth—First Edition and 2002 Supplement, Envision Utah, 2002. Available online at http://envisionutah.org/Introduction.pdf. U.S. Department of Energy's Smart Communities Network, http://www.sustainable.doe.gov/welcome.shtml, accessed March 21, 2005.